USPA NEWS - The French Culture Minister, Franck Riester, inaugurates the Toutankhamon, at La Grande Halle de la Villette, in Paris 19th district. The Egyptian Culture Minister, was . The Curator of the Exhibition, was also reprint, and the happy few special guests who accompanied the two Ministers from France and Egypt. Fifty years after “the exhibition of the century” – which had gathered more than 1.2 million visitors in 1967 in Paris – it is a unique opportunity to rediscover the history of the most famous of the Pharaohs before the permanent installation of the artifacts within the new Egyptian Grand Museum currently under construction. 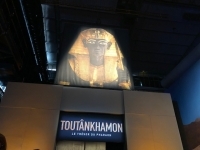 Presented by the two Ministers of Egyptian Antiquities, and French Culture, at the Grande Halle de la Villette, this immersive exhibition will unveil more than 150 original objects from the tomb. More than 50 pieces from this collection will travel for the first and last time out of Egypt. The organizers say they expect, at least 1 Million visitors, from March 23rd to September the 15th. The exhibition displays in a very subtle sober visit and 150 personal belongings of the young sovereign who accompanied him in the two worlds that are life and death.